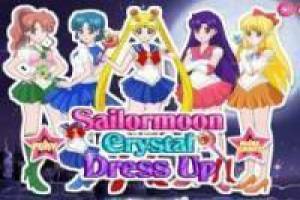 Play dress up Sailor Moon Crystal in this game where you can change their traditional clothes for a more casual. All of them are looking forward to help him change his style, but do not forget to equip it with their magical artifacts to recover the crystals. Enjoy the game Sailor Moon Crystal Dress up, it's free, it's one of our sailor moon games we've selected.